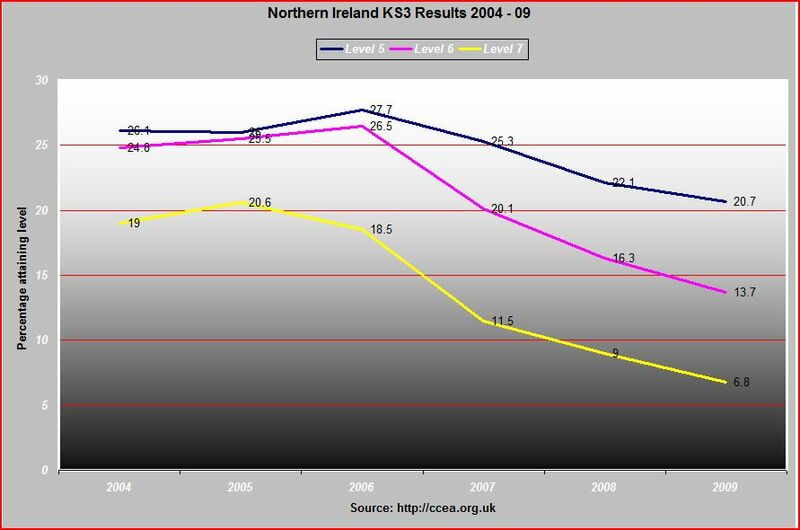 PACE has uncovered that in the last 2 years Northern Ireland’s Key Stage 3 literacy levels have crashed. The general decline in pupils’ attainment is best evidenced in the results obtained in English at Key Stage 3. Statistical figures obtained from the Council for Curriculum Examinations and Assessment (CCEA) demonstrate a year-on-year decline in the Levels of attainment obtained in the examinations. Key Stage 3 tests are taken by students in third year at post-primary school. In an unexplained development the pupil absence figures for Key Stage testing have risen from a baseline of around 3% to a staggering 44.5% this year. The Government examination body statistics also show that in recent years following the introduction of the revised curriculum Teacher Assessment predictions have overestimated the pupils’ actual results by a factor of two or more. (See Table above) The natural consequence is that both the parent and pupil will believe that satisfactory progress is being made and discover too late the truth of the matter after irreplaceable learning time has been lost. Instead of improvements the Key Stage 3 literacy levels have crashed. As parents can see from the CCEA figures the Department of Education has failed on this vital issue yet again. While the decline in pupils achieving Level 6 at KS3 has doubled over a five year period and the negative trend has almost tripled at Level 7 there has been no comment or concern raised from any quarter of the education establishment. The fact that none of the highly paid education watchdogs have reported that something has gone seriously wrong must reflect a degree of complacency over numeracy and literacy. • What is going to be done to reverse this numeracy and literacy decline in schools before the betrayal of an entire generation of pupils in Northern Ireland becomes irreversible? • When will those responsible for failed education initiatives be actually held to account?